Said good friend has a mother who sews (quilts) and has given away home-stitched party favours at previous birthday parties. She also really liked looking at Tyo’s Closet Monster book, and even gave Tyo an old PJ shirt* she didn’t like to turn into a monster. 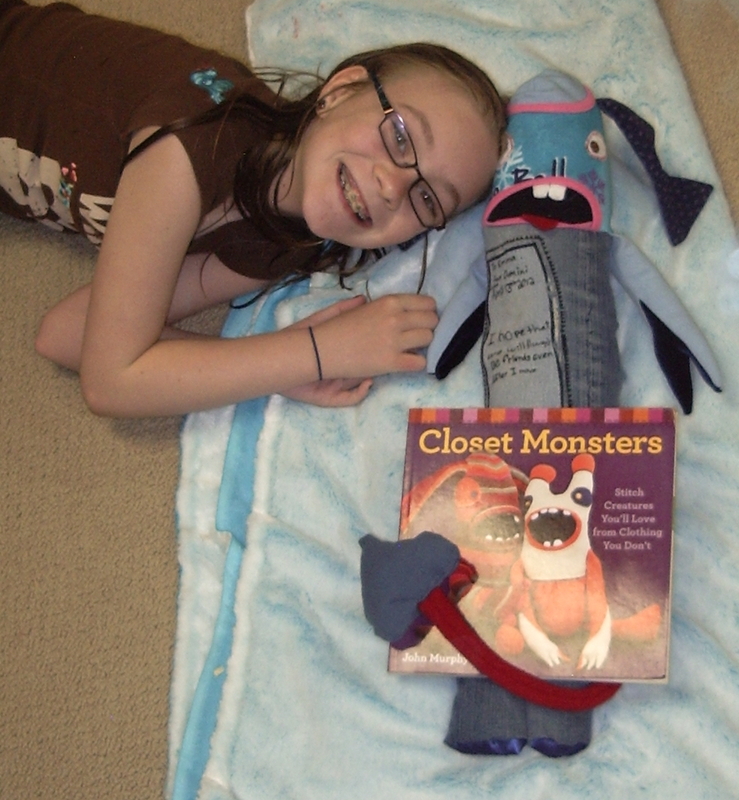 So naturally, Tyo wanted to give this friend a closet monster for her birthday. I won’t go into too much boring detail. 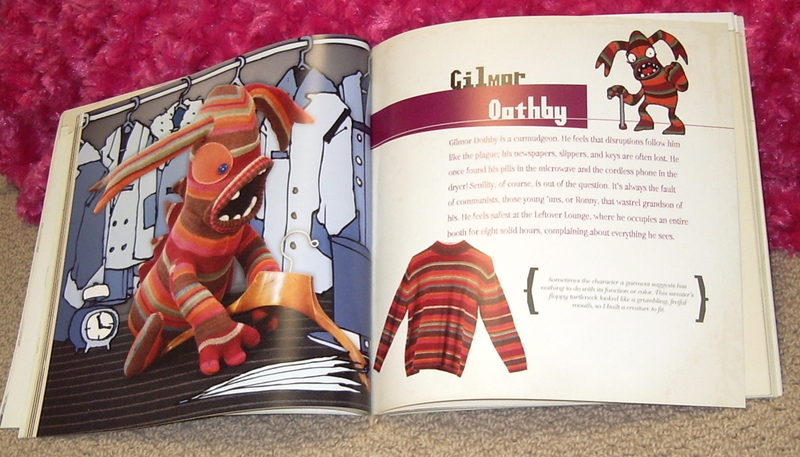 The inspiration monster was Gilmor Oothby, who also appears on the book’s cover. We did not follow the directions particularly, because Tyo doesn’t read directions very well and I couldn’t be bothered. We looked at the picture of the pattern pieces, but that was about it, especially since we wound up using mostly fabric scraps from the massive Scrap Stash of Doom , and not much in the way of the actual shirt, which had a cute penguin on the front that Tyo wants to applique to something else. And was a really soft, thin knit not really suited to monsterizing. 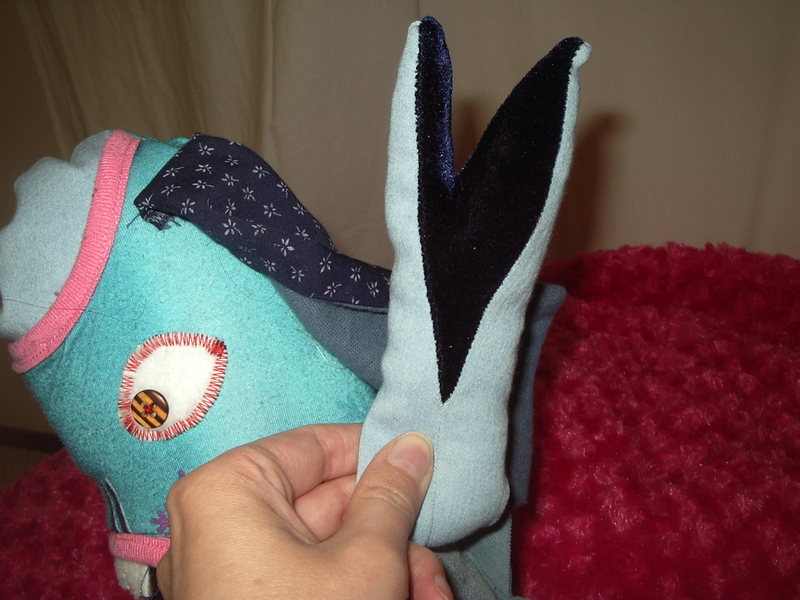 The trickiest part was getting the bottoms of the feet and the bottom of the body approximately the right size—but fortunately, approximately was plenty good enough. Anyway, Tyo managed a fair proportion of the construction, and I did the trickier bits, and while it was definitely a joint project I feel pretty satisfied that she held up her end of things. There was a modest amount of un-picking where we went too far off the rails (like forgetting to insert the arms), which was accomplished with only minor grumbling. I am told his name is "Freddy." 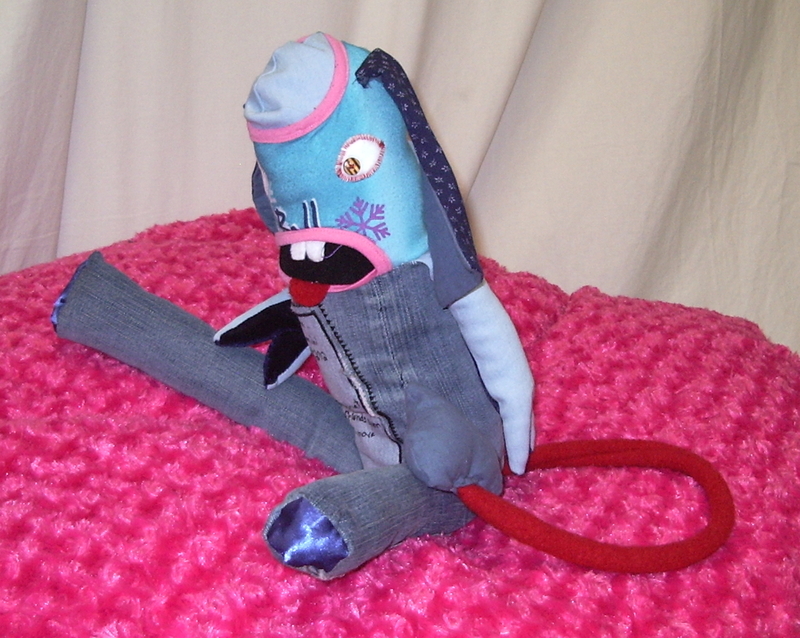 The body is made out of one leg of what was once my favourite pair of jeans. When Buffalo Jeans discontinued their City X style, it was probably the first step on the road to making my own jeans, because man, nothing has quite matched them since. /sniff. 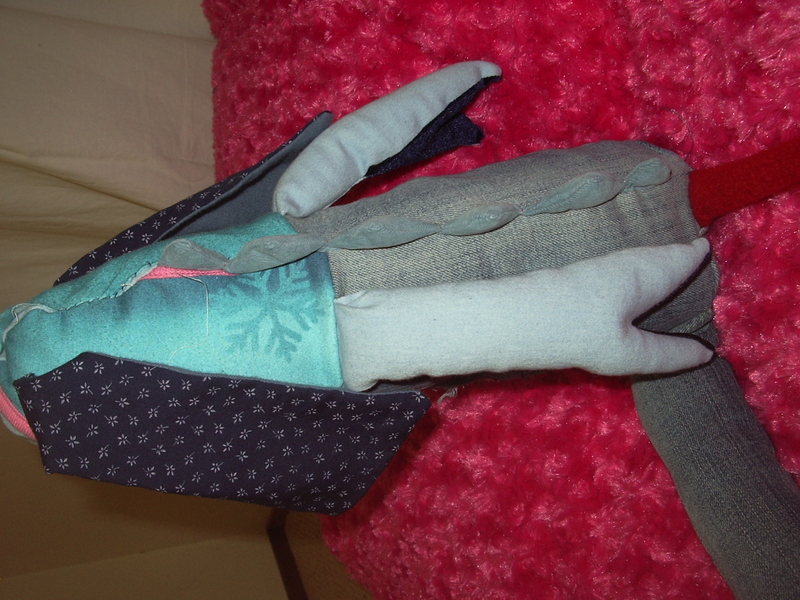 Every other piece of fabric on the body (aside from the head/mouth that was from the gifted PJ shirt) is a scrap left over from some other project on the blog. I’m tempted to list them, but it would be long and probably boring. How about you guys guess? Y’know, with all that free blog-reading time you have. There was a certain amount of goofiness. *Turns out it was actually a nearly-brand-new shirt she got for Christmas. Oops. That’s terrific! I’ve seen that book but I know my kid won’t take it on. She likes the idea, but not the hard work 🙂 She should be very proud of this great finished object. Aw he’s…cute. 😀 No seriously, good job both of you. He turned out really great, and would be an awesome gift! I hope Tyo’s friend liked him. What an awesome gift. I think you may be making more of these in the near future. I really love it that your kids are interested in sewing, it seems to happen so rarely that sewing goes from one generation to the next. What a perfect starting point, something to show off, but it doesn’t have to fit. I love Freddy. That’s the most adorable monster I’ve ever seen! 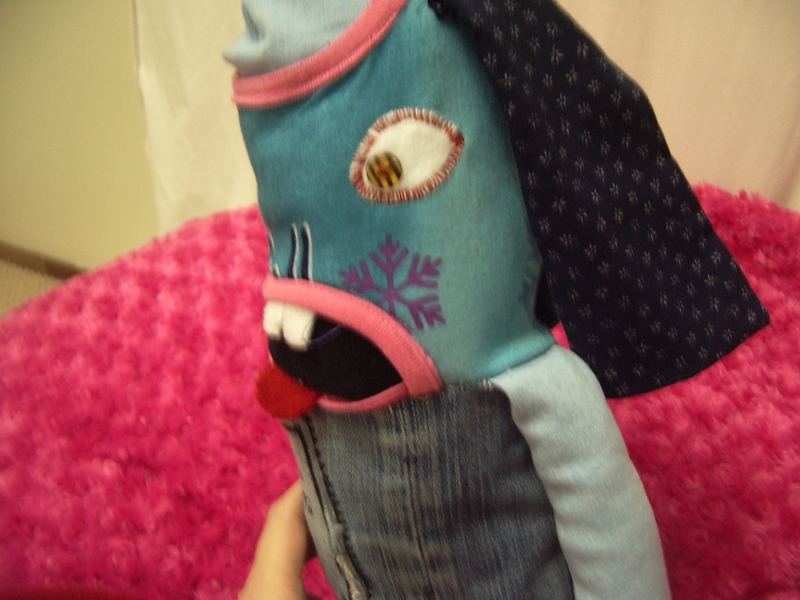 I used to love making sock dolls when I was Tyo’s age, but I didn’t have a lot of supplies so they were extremely basic sock dolls — hairless, armless, you get the picture. My kids have no interest in sewing, but then they are not very crafty in general — even though I bought all the art supplies when they were toddlers and encouraged them to make messes. The closest we’ve come to any kind of craft interest is Middlest’s short-lived phase of tracing Pokemon characters. My husband is not really crafty (except for drawing) and his mother is not crafty at all. The absence of the urge to create perplexes me. Too cute! I don’t have any kids (yet) but I’m such a sucker for funky little sewed dolls and crafts. You all did an awesome job! Although the scrap-busting aspect is pretty awesome.